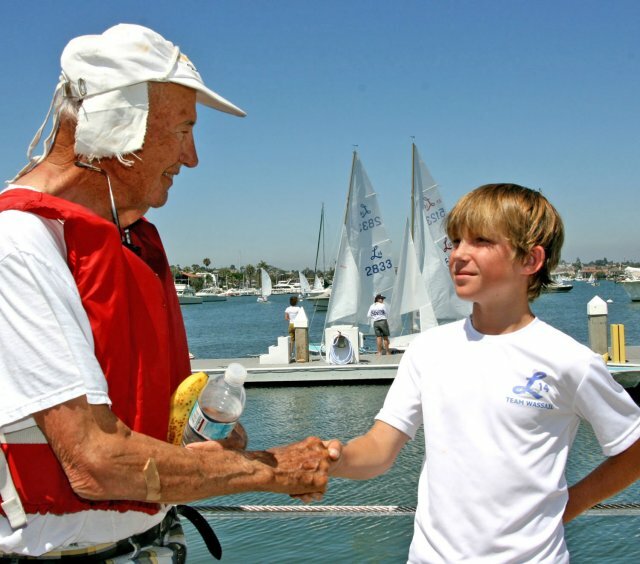 • Mark Gaudio and David Swain win in talent stacked Roy Woolsey Regatta. 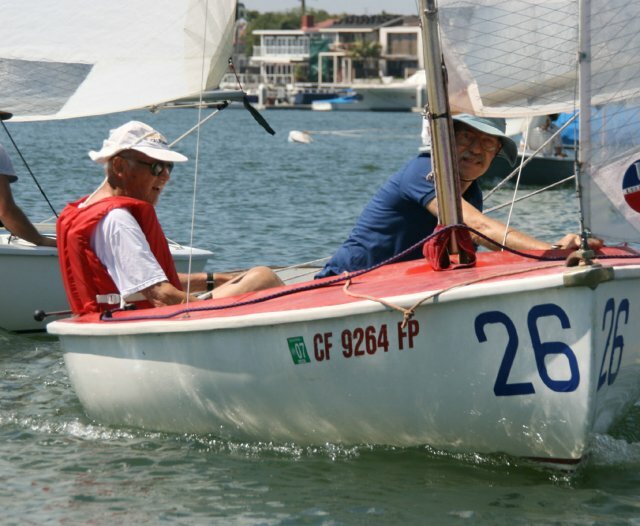 The 2007 Class Championship winning team of Mark Gaudio and David Swain handily won the deeply talented 17 boat A division (25 boats total). Top sailors racing including Kurt Wiese, Kim McRae, Len Bose, Steve Kent, Steve Schupak, Bob Yates, John Papadopoulos, John Fradkin, Gary Thorne, Walter Johnson, and 2008 Class Champions Stu and Erin Robertson. With winds coming from the SSW (approximately perpendicular to the channel of water that Lido Isle Yacht Club resides on), the playing field was seriously short (perhaps 100 yards to weather) and very wide (to the sides), the A fleet racers struggled a bit with a cramped pre-start area and the short first weather leg and the race committee struggled even more with a series of general recalls (in 3 out of the 5 races) and some of their own snafus slowed - all of which brought racing to a crawl in the early stages of the regatta. For all these reasons, and more, being able to start on the preferred end of the start line was a luxury - and those that were able to start with speed often found themselves punched out and in the lead - giving a range of teams stints at leading a race. Once past the weather mark, boats had a long reaching around the tip of Lido Island on their way to the leeward mark. In three of the 5 races, the leeward mark was right at the tip of Lido Island, which is a famous part of Newport Beach for it's geographic wind shift. The historic tactical (upwind) approach to the tip of Lido Island is to short tack one corner of the tip of the island so demand can be pretty heavy for the tiny amount of water being sought after. Invariably positions change due to variability in deciding when to go "in" to the shore or simply due to the close handed tactical sailing that will result. One of the last tactical decisions will be how far to sail upwind beyond the tip of the island. Go to far and you'll risk over-standing the finish line - giving room to boats that cut the corner a little closer. On the other hand, if you sail right along the edge of Lido Island, you take great risk that you'll be sailing in bad air (as it rises over the homes along the island) or that you'll encounter a header that forces you to tack away - something everyone would be loathe to do given that it's essentially a one tack beat or tight reach to the finish. Given the normal protestation that reaching legs are virtual parades in the Lido 14 fleet, you could be excused from thinking that once you got around the corner of the island (on the way back to the finish) that the race was all but wrapped up. Not at all! At this event several people found it very hard to keep in clean air and invariably they were shot out the back of a small pack or simply out sailed. Lessons learned? Clean air is king, always cover the boat behind when finishing, and never give up! In 1958 - the year that the Lido 14 was introduced, Roy Woolsey and his son Roy Jr. raced in the Lido 14 Championships. 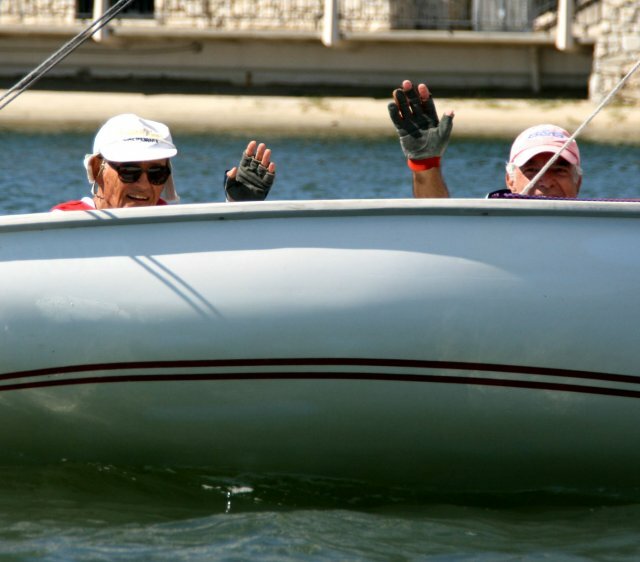 50 years later, they also raced together in the 2007 Anniversary Championships, showing all of us that Lido 14 sailing and racing is a life long pursuit. 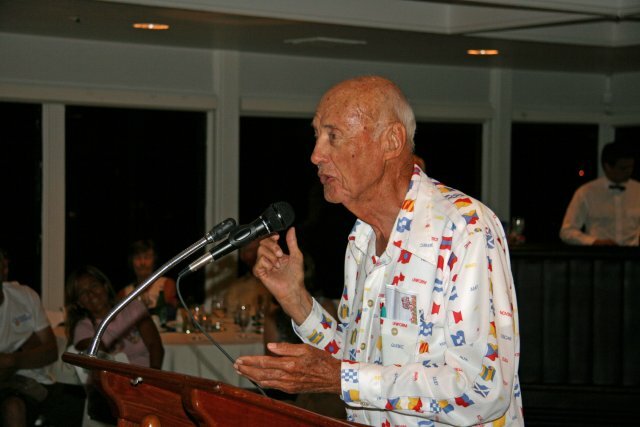 Roy lead an exemplary life, serving as our role model on how to live, love, and pursue happiness. Roy passed away in August of 2007. 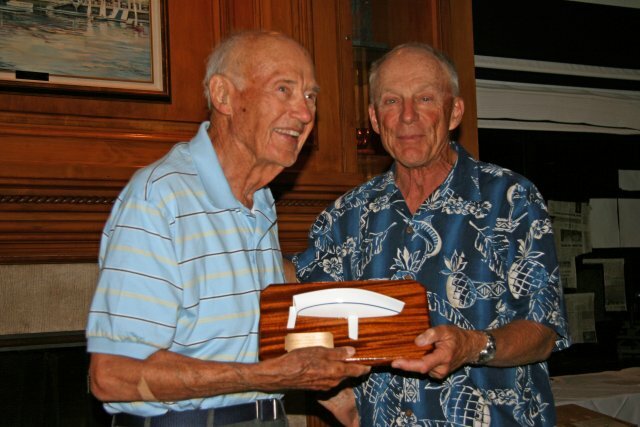 Even before his passing, Lido Isle Yacht Club has recognized Roy thru its support of the Roy Woolsey Regatta which hosts racing in the Lido 14 and Laser sailboat - boats which Roy was very fond of racing.